Since Dracula's rise to power a shadow has swept across the nation, but nowhere is it darker than in the Deep South. Throughout the plantations, swamps, and cities, rumours abound of grotesque rituals, hooded figures, and bizarre creatures. Most terrifying of all, however, are the whispers of ancient magic - unspeakable arcane rituals and occult powers that can lead those who wield them towards mystical supremacy… or reduce them to gibbering wrecks. 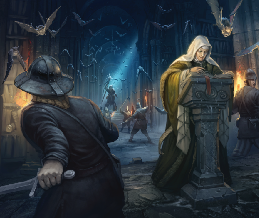 This new supplement for Dracula's America: Shadows of the West introduces two new factions: the corrupt cultists of the Church of Dagon and the Salem Sisterhood, occult practitioners whose history dates back to the early Colonies. New stealth rules allow for all manner of sneaky and underhanded tactics, while expanded rules for arcane powers offer glory but could cost you your sanity. Alongside these are a host of new scenarios, Hired Guns, monsters, skills, and gear to challenge or assist those who dare venture into the Deep South of Dracula's America. Jonathan Haythornthwaite has been an enthusiastic gamer for 26 years, inflicting countless 'home-brewed' games and scenarios on his long-suffering gaming friends in that time. He currently live, works, and occasionally sings Classic Rock in the North Yorkshire Dales.aRU-MOR was born in Tarragona, Spain. She studied Fine Arts at the University of Seville, specializing and working on artwork restoration. She began her professional career in 2000, sculpting historical, fantasy and science-fiction miniatures. These days she combines her work as a miniaturist with her work as a freelance illustrator. She has provided illustrations for various Spanish RPGs, books and card games since 2009, as well as for historical themed publications.